Data from the latest NHANES surveys show that 85.7 million adults in the US have hypertension. That's 34% of all adults and is up from 77.9 million just several years earlier. Do you travel frequently? And, are you frustrated by how all that travel affects your exercise routine? 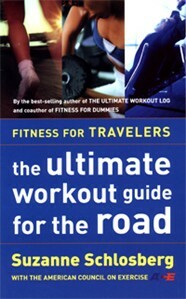 First, pick up the book Fitness For Travelers - The Ultimate Workout Guide For The Road by Suzanne Schlosberg, in cooperation with the American Council on Exercise (www.ACEFitness.org). Schlosberg is a health and fitness writer and a frequent contributor to SHAPE magazine. But her most impressive credential (in my opinion) is that she has cycled across the country....twice! • Not enough time to exercise: Possible solutions include exercising first thing in the morning, doing your work-related reading while riding an exercise bike, and, simply not cramming so much work into each day. Plan your day so that there is time for exercise. • Jet lag: Jet lag can really make you feel lethargic. Here, the strategy is to plan your flights so that you arrive in your destination city in the early evening, if at all possible. Other strategies that help, according to Schlosberg, are to drink enough water, and to not start your trip sleep-deprived. THERE'S NO GYM IN MY HOTEL! • Use the pool: If the hotel has a pool, you can do laps....assuming it is big enough. Or, consider using the pool for aquatic exercises. For example, running in chest-deep water is a tremendous work-out. You can also do Tai-Chi, or more vigorous martial arts moves in a pool. • Bring some exercise gear with you (see below), such as a jump rope, springs, or exercise bands. Even without exercise gear, you can always do push-ups, crunches, squats, and flexibility and stretching exercises in your room. • Do you have a back-pack? You can stuff bottles of water or heavy books inside it to increase the load when you do squats, lunges, or push-ups. • For weights, ask the kitchen for some empty plastic jugs. You can fill them with water. One liter of water weighs 2.2 lbs. One gallon of water weighs 8.3 lbs. If it's a gallon jug with a handle, you can use this as a dumbell. If you have several, you can loop your belt through the handles to increase the weight. For smaller bottles, stuff several of them into a plastic bag with handles to create enough weight. • For dips and push-ups, you could use the seats of 2 chairs, or even the edge of the bed for this, too. • Ask the hotel concierge if they can provide a personal trainer. The trainer can bring some work-out gear and/or give you a personal session. • Find a local gym: If you find yourself in a hotel with no facilities, then find a local gym. Many health clubs now allow individual visits from non-members for a small fee. According to the web site Statista.com (accessed April 17, 2018), in 2015 there were more than 186,000 fitness centers worldwide. The US has more fitness centers than any other country on earth: 36,540 (2016 data). Brazil has over 30,000 fitness centers, while Canada and the UK each have just over 6000. Several outstanding web sites for finding health clubs are listed at the end of this review. • Find a local track: If you like running on a track, see if there is a high school or college campus near by. • Walk! You can always walk. In your hotel, you can walk the stairs. In the airport, walk up and down your concourse until your flight begins boarding. 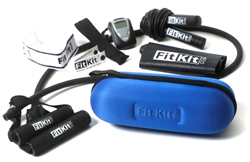 • Fit Kit: The Fit Kit ($39.99) is a small but versatile kit that allows you to perform cardio, strength, and flexibility exercises. It contains an exercise band, a resistance tube, a jump rope, a door attachment, a reflective arm band, and an ID tag. You can even take it with you when you travel. In summary, there's absolutely no excuse for not exercising while on the road. All you need is some imagination and a little planning. Just remember to not pack your daily schedule so full that you have to cheat yourself on sleep to find the time to exercise. As a follow-up to their best-selling book The Athletic-Minded Traveler, Jim Kaese and Paul Huddle launched AthleticMindedTraveler.com. On this web site, you can find fitness-oriented hotels, health clubs, running routes, etc., in various US cities. • AirportGyms.com is a unique web site. It was launched in 2002. It is a free web site and survives on donations. It lists not only gyms inside airports, but, also, gyms near airports like Bally's, Gold's, LA Fitness, and 24-Hour Fitness, and smaller gyms, too. As of January 2014, their database includes 187 gyms in the US and 11 gyms in Canada. Only airports in the US and Canada were included in the database. • The best web site I have found for searching gyms is GymTicket.com. By entering a zip code, you can obtain a list of facilities within 30 miles of the center point for that zip code. Their database contains over 20,000 facilities, the largest and most accurate database of fitness centers in the US. 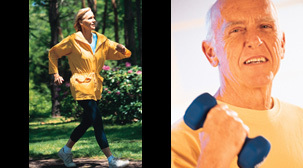 • 24-Hr Fitness has more than 400 locations in 18 states. Their web site www.24HourFitness.com has a search tool. You can enter your zip code and find clubs nearby. 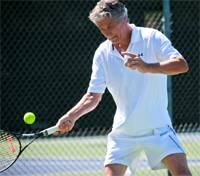 • www.HealthClubs.com is a web site maintained by IHRSA. This web site has a club-finder feature, though it only lists clubs that participate in the IHRSA Passport Program. You must be a member of this program. • www.YMCA.net is the web site for the YMCA. • If you want to find a place to swim, even if it's in a hotel or public park, then check out www.SwimmersGuide.com. This site has a mind-boggling database of 17,000 swimming pools around the world. This site first went online in 1996. The database was initially published in book format in 1993 and 1995. • Schlosberg's Fitness For Travelers - The Ultimate Workout Guide For The Road provides exercise routines for aquatic exercise, climbing the hotel stairs, and even rope jumping. It contains dozens of photos showing various exercises. It was published in 2002 but it's still a useful resource. • Eating On The Run by Evelyn Tribole, MS, RD, packs a ton of information on hotels and fast-food franchises into 216 pages. • Get With The Program Guide To Fast Food & Family Restaurants is written by Bob Greene, an exercise physiologist and Oprah Winfrey's personal trainer. This book contains detailed information on fast food franchises in the US and is small enough to keep in your briefcase or purse. These and other books are reviewed in our Book Reviews section.